In a recent nationally representative study, we surveyed people’s ideas about climate stability. Interestingly, the Six Americas had very different ideas about how the climate system works. 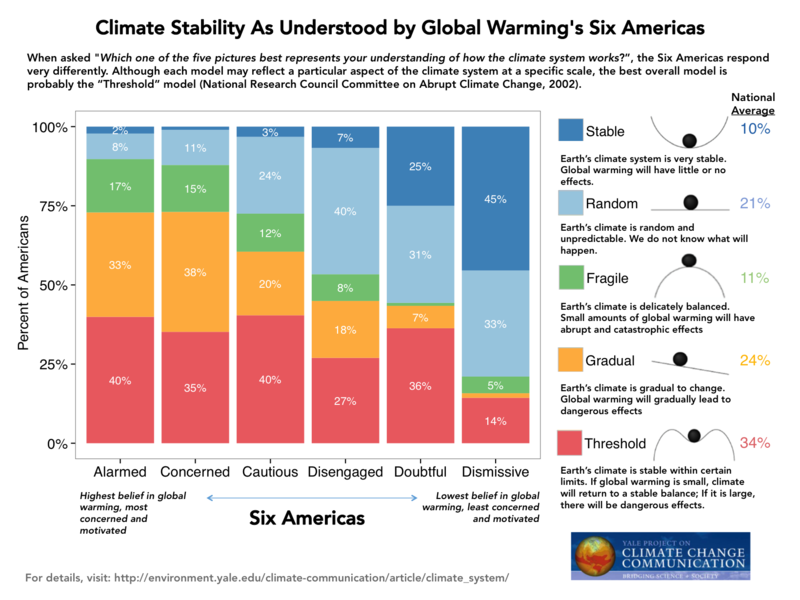 At one end of the spectrum, the Alarmed and the Concerned were most likely to say that they understand the climate system in terms of a “Threshold”, “Gradual”, or “Fragile” model. Meanwhile, the Dismissive were much more likely to view it as “Stable” or “Random”. Although it is difficult to make a generalization about the climate system as a whole, “Threshold” is probably the most accurate overall model. As just one example of a threshold at a specific time and place, scientists recently found that the melting of the West Antarctic Ice Sheet may have already passed the point of no return, committing the world to up to 10 feet of additional sea level rise over coming centuries. For more, check out our note about Americans’ mental models of climate stability. These and other findings are from Americans’ Knowlege of Climate Change, our national study of how Americans understand the climate system and the causes, impacts, and potential solutions to global warming.